邓纯博, 刘林, 肖正俊, 阿良, 李洪秋. 骨质疏松小鼠骨组织中miR-21及Smad7的表达及其与骨密度的相关性[J]. 中国医科大学学报, 2019, 48(1): 44-47. DENG Chunbo, LIU Lin, XIAO Zhengjun, A Liang, LI Hongqiu. Expression of miR-21 and Smad7 in the Osseous Tissues of Osteoporotic Mice and Its Correlation with Bone Mineral Density[J]. Journal of China Medical University, 2019, 48(1): 44-47. Abstract: Objective To investigate the changes in the expression levels of miR-21 and its regulatory proteins in bone tissues of osteoporotic mouse model, and its correlation with bone mineral density. Methods Thirty ovariectomized (ovx) female mice were randomly divided into six groups according to different observation time (0 week, 1 week, 2 weeks, 4 weeks, 6 weeks, and 8 weeks, respectively). Smad7 expression level in the tissues of the distal femur of these mice was immunohistochemically analyzed. Real time PCR was performed at different time points for detecting changes in the mRNA levels of miR-21 and Smad7 target genes in the bone tissue. Dual-energy X-ray absorptiometry (DXA) was used to measure the distal femoral bone density in mice of each group. 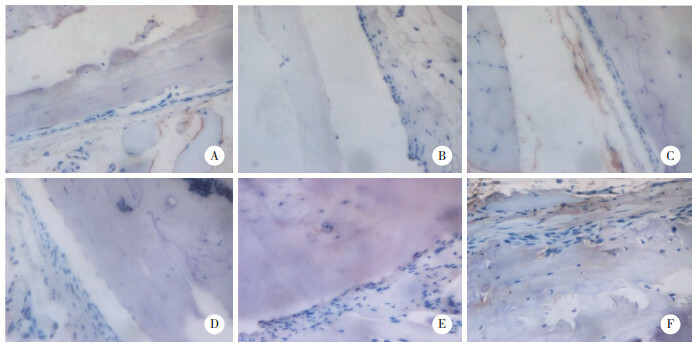 Results Immunohistochemical study revealed that the expression of Smad7 in the bone tissue of osteoporostic mouse gradually increased over time. Real time PCR analysis showed that the expression of miR-21 gradually decreased, whereas the expression of Smad7 gradually increased. Over time, the bone density of mice gradually decreased, indicating that miR-21 was positively correlated with bone density, whereas Smad7 was negatively correlated with bone density. Conclusion Bone density of the osteoporotic mice gradually decreases. The expression of miR-21 is positively correlated with bone density, while that of Smad7 is negatively correlated with bone density.